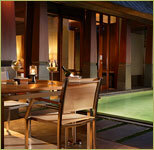 The Kayana in Bali is located at the heart of Petitenget, a fashionable area on Bali's south-western coast. 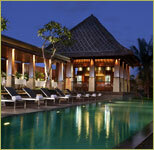 The hotel is conveniently located just a 25 minutes' drive away from the Bali’s international airport. A few minutes' walk from the hotel can take you to the array of restaurants, a collection of stylish designer boutiques, several tourist attraction sites and vibrant night spots. 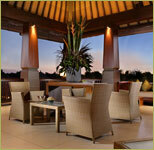 The Kayana in Bali includes the arrangement of the on-site restaurant just next to the main pool. It serves the best of the international cuisine and local specialties. The lounge stocks up a rich selection of imported wines, cocktails and afternoon tea and is an ideal spot to hang out. 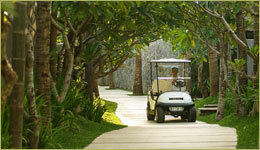 The Kayana in Bali includes some other facilities like free shuttle service to Legian and Seminyak area, handicap traveler facilities, tour arrangements, buggy service, currency exchange and 24 hours butler service. Each of our 24 villas is set within a private walled garden, complete with its own private pool or alternatively a plunge pool with a hot water facility. 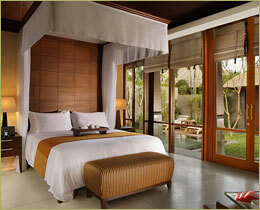 Furthermore, each villa presents an outdoor living and dining pavilion, a stylish bathroom with bathtub and shower. Each is equipped with a plasma satellite television, iPod and sound dock, safe deposit box, and a thoughtful array of amenities. The Dauh Lounge presents a selection of imported wines, cocktails and afternoon tea. Pamper your body, uplift your soul, refresh your mind and re-awaken your senses. 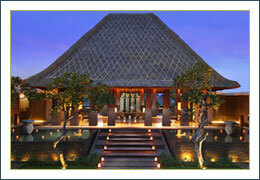 Ayur Spa takes its name from the Sanskrit word, meaning 'Life". This tranquil haven is characterised by the contemporary elegance of its immaculate treatment suites. Designed for couples, each spa suite boasts a steam room, an open-air double shower, a private gazebo and a Jacuzzi.